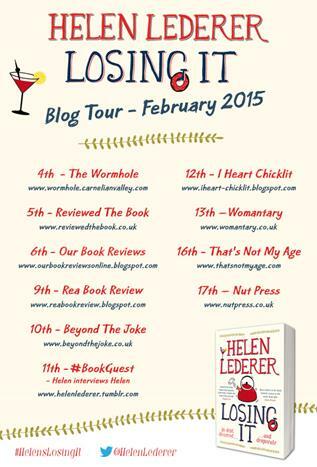 Welcome to the final stop on Helen Lederer’s Losing It Blog Tour! You’ve read the review, Losing It was launched last Thursday and is currently out in the world in a bookshop near you, so now it’s time to talk to its author. I’m thrilled to welcome the lovely Helen Lederer to the Nut Press today. I now know which Millie favours but what about you, Helen: Margarita or Mojito, followed by a bottle of wine, or no messing around and straight to a bottle of wine? Mojito can be festive and slow down the inevitable graduation to a bottle of plonk when one starts realising the cost of the individual cocktail and the item taken to get the pith of a fruit into a glass… give me the WINE! Millie has an humiliating episode in a hotel lobby thanks to some shapewear. Should we squeeze ourselves into those things, or let it all hang out (while still being fully dressed, obviously!) and embrace the bodies we have? Well a certain ballast underneath a dress for evening wear can enable getting out of the house at times? But I say no to the girdle on top of waist clincher and corset… what if one was in a car accident – what would the paramedics make of it all? Sustaining the comedy over a full-length novel is an incredibly hard thing to do but you’ve managed it really well without Millie becoming a caricature. Clearly, she’s a desperate woman but she’s also desperately funny with it, and very human. How important was it to you to get this balance right, and not make her a figure of fun? Ah yes, that was interesting – I’m not sure, but I’ve noticed that authenticity is the only way to connect – so showing her less charitable thoughts of others somehow made her likeable. By exposing the human failings we all have we make ourselves acceptable to each other – with love. Do you think it’s inevitable that women will lose it in some shape or form, whether by being angry, feeling down or having a meldown? I lose it quite regularly especially when I have a hangover I find I can’t even park or work my iPhone. It’s nice to feel vexed sometimes – it means there are things we have to get done – we have purpose! How important was the daughter’s story to Losing It? And why Papua New Guinea? Was this a way of sneaking in mention of the havoc that periods can wreak on a woman’s life, and using it as a metaphor generally? I loved having the sub plot of Papua New Guinea and the paradox that Mary needed a swamp environment to do her anthropological study – and yet illegal logging was the very thing that was keeping the land swamp-like – a bit of geopolitics never hurts. The period metaphor is now something I will claim as my own, thanks Kath! What would you like to see readers losing (apart from themselves in your book), and what do you want them to gain from reading Losing It? I want them to lose the prejudice that I can’t write – and I want them to gain the knowledge that a laugh out loud book is utterly cool and to be coveted. 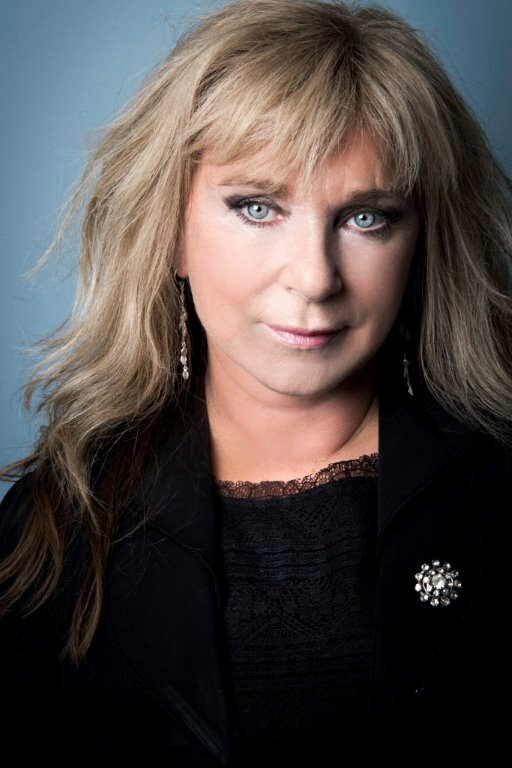 Helen Lederer is an actress, author, comedian, journalist, public speaker and voice over artist. Her debut novel, Losing It, is published by Pan Macmillan and is now available from all good book outlets and online from Amazon UK, Amazon US, Book Depository, Hive and Waterstones. Great choice! Save some white for me – I’m running off to Florence, so I’ll be able to pop down to your villa for a weekend and have a dip in the pool! It would definitely be a Greek island for me, most likely Santorini. I’d be looking out to sea, enjoying one of its magnificent sunsets and sipping an aperitif of chilled Ouzo and ice. Bliss! I love Santorini, it has some of the best sunsets I’ve ever seen. Can just imagine doing this… And the good thing about Ouzo is that it tops itself up every time you have some water! Being Welsh, I wholeheartedly approve of your choice of destination – and that is the perfect drink for Snowdon, too! Thanks for stopping by and taking part, Andrea. 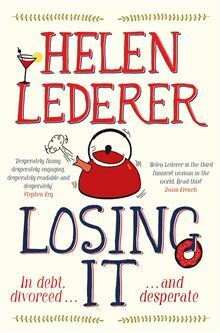 And the winner of a copy of Helen Lederer’s novel Losing It is… *much stamping of squirrel paws* … Claire! Congratulations! I’ll get it in the post to you as soon as possible. Have a great weekend!